No one tells the Niagara Hospice story better than the patients and families we serve. Many family members are so moved by the support they received for both themselves and their loved ones that they choose to become Niagara Hospice volunteers. 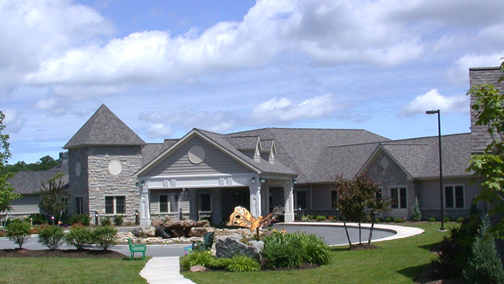 June 5, 2007 marked a significant event in Niagara Hospice's history. What was once just a dream and a pebble on the ground, Niagara Hospice House opened its doors to its first patients. This June we will celebrate ten years of service and caring for patients in need of hospice residential and general in-patient care. Plans are underway to commemorate the anniversary, including collecting Hospice House family stories, and memories of their time spent with loved ones at Niagara Hospice House. If your loved one was served at Niagara Hospice House, please consider sharing a memory you have by clicking the link directly below. "Mary, if Alice were my mom, I would turn to Hospice for help"....these words offered by a family friend familiar with Hospice were honestly the last words that I wanted to hear when considering healthcare options for my frail and infection-wracked mother....but they were words that were prophetic in so many ways. At left is Mary's mother, Alice, with her grandson John Taylor, Jr.
"Two years ago, one of my best friends stayed at Hospice House just before going home to be with Jesus. Many days I sat by her bedside holding her hands, putting lotion on them, talking to her. Everyone at Hospice from dietary, to nurse's aides, to nurses and doctor were so very kind and respectful not only of Nancy, but of any visitor and family member. I remember one specific day I was praying with Nancy and the aides were coming in. They came in quietly, saw we were praying and waited patiently until we were done. Then just continued on with their duties with such kindness. Two months later - I was back in room 18 sitting with a co-worker this time. It was too soon! But I still experienced the same kindness with the staff. So respectful of privacy! I know all of us will come to that day when we say goodbye to life on this earth, if the good Lord sees fit, it would be a blessing to spend my last days there. 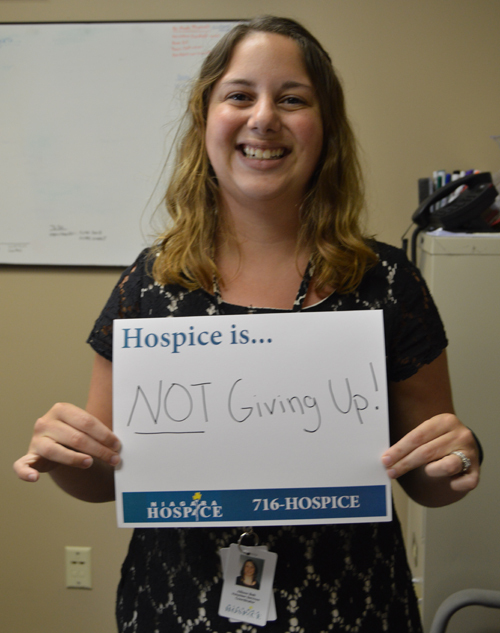 Hospice is a place we hope we never need, but a place we are blessed to have in our little city!" "One of my favorite examples, though, comes from a hospice patient with whom I volunteered to play cards and board games. One day in the heat of a particularly close game, she suddenly exclaimed, "I'm having fun! I'm having fun!" Prior to being on hospice care, she had all but given up on being able to still experience enjoyment..."
At right is Pat Evans, Niagara Hospice co-founder, Board Member and Volunteer standing at the entrance to Niagara Hospice House that, without her early vision, would have remained a mere pebble on the ground. "I have been an employee of Niagara Hospice for 3 1/2 years so I know how wonderful the organization is and always try to be an advocate in the community. It wasn't until recently I had a first hand experience with Niagara Hospice with the passing of my grandpa to truly solidify my understanding of what Niagara Hospice has to offer. 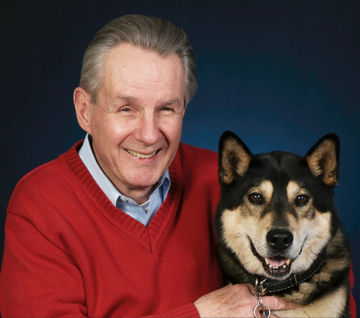 From the very beginning to the very end, every member of the Niagara Hospice staff treated him with the utmost care, always maintaining his level of dignity. His nurses were always attentive to his needs and never made us feel as if our concerns were trivial. They spent as much time as we needed and provided us with the support that not only he needed but us as well. We will be forever thankful as his last days were able to be spent in a comfortable and supportive setting, surrounded by his family. I now have a deeper connection to the idea of what hospice does, who hospice is and how powerfully beneficial it is to have them close when a loved one is dying. But more than anything, I know that in a very short time period, I have been in the presence of truly dedicated people (who I am honored to work with) who are genuinely concerned with giving their patients honor, dignity and above all, comfort at a time of the direst need." "On September 5, 2015 Elise shared that she wanted to go into Hospice House because she couldn't obtain any relief from her symptoms at home anymore. Her cancer was progressing quite a bit. Not only had she lost her sight completely by then but she was also becoming more and more uncomfortable. She had always said she wanted to pass away at home but she had a change of heart. I now believe It was the best decision for her. Hospice House staff were able to comfort her in ways we were not able to. Elise loved that she could have the assistance to use the spa tub and listen to the fountain outside. We were relieved she was able to keep all of her medication down through intravenous means (she spent all day at home just trying to keep her medicine doses down, the melanoma in her brain made her naseous and with constant headaches). I think most of all Elise sensed that we were all taken care of at Hospice too. I think that brought her relief to know we had support as we were supporting her. The nurses and kitchen staff and all the employees allowed us to be there for Elise. Elise was able to connect with the staff despite her deterioration and find comfort through their kindress and even her favorite nurses sense of humor. After Elise passed the bereavement department offered support and resources which have been monumental in our journey through grief. All of the staff at Hospice was incredible. The nurses Debbie, Cheryl and Alex were beyond amazing. Laurie Stickney's support for my mother and I is without a doubt a life saver as well. 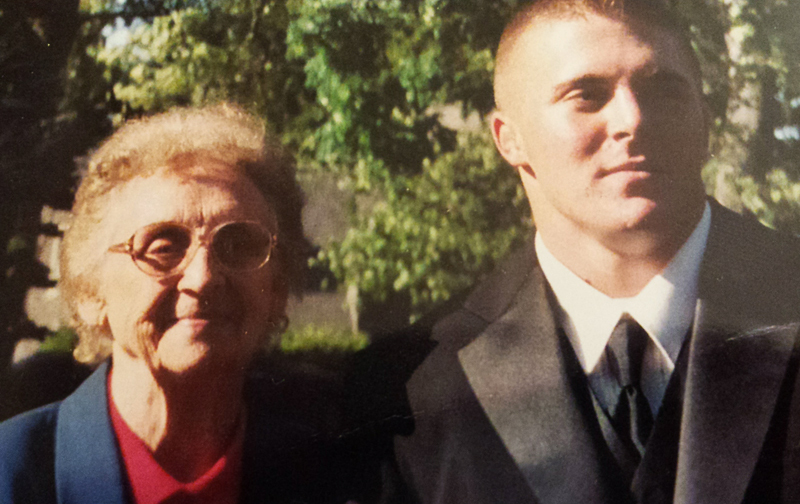 Elise Schunk Sept 11, 1991 - Sept 24, 2015"
"My mom was at Hospice House in October of 2012. We were so pleased with the care she got. She was only there for 4 days but she passed with dignity, something I am very grateful for. The staff, and doctors were wonderful. God bless them all." "Several years ago when my late mother-in-law was diagnosed with a serious illness, my wife and I contacted Niagara Hospice when it became apparent she was declining significantly. The hospice care she received initially in our home and later at Niagara Hospice House was extraordinary..."
Mike is shown at left with Prince, another Niagara Hospice volunteer who has since passed. Prince was loved by every patient and family member he visited and he is missed by many. "I thought as her caregiver that I was doing a great job. The care she got at the Hospice House was outstanding." 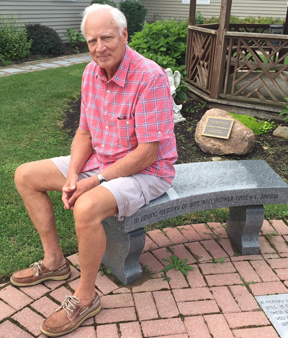 At right, Gerry sits on the bench he purchased in memory of his wife Nancy to help support the Niagara Hospice Memorial Gardens. "It's been two years and not a day passes that I do not thank God for the care my husband received while under hospice care in our home. I truly do not know how to put my gratitude into words! When we learned that David would be placed in hospice care in August 2014, we had no idea what to expect. Days turned into weeks & weeks into months, yet not a day passed that we didn't feel the love, care & support from our hospice team! Losing my best friend to brain cancer was by far the most difficult thing I have ever experienced thus far! With our hospice team, this time in our journey ,in a sense, was a time of hope! We didn't have to go through this alone. Daily caring, professional & selfless staff brought that hope right into our home! God bless each one of you!" 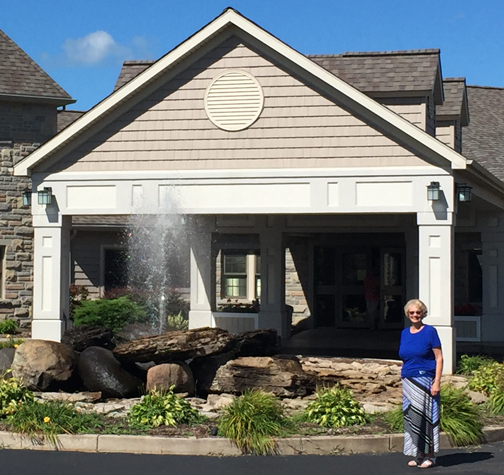 "I have been a home care aide for Niagara Hospice for 5 years now and there aren't enough words to describe how grateful I am to be able to do what I do to help my patients and family members. It gives me great joy to walk into a person's home and make them feel a little better and to make them smile. All the paths I journeyed on led me to Niagara Hospice!" 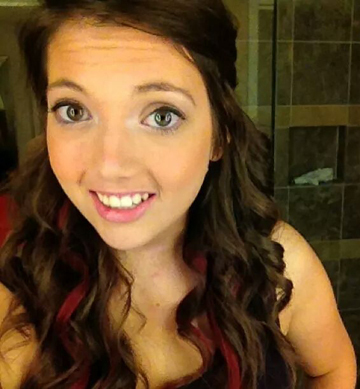 "I had just started working at a spa when someone told me I should apply to Niagara Hospice. I hadn't wanted to go into the medical aspect of my field, massage therapy. I applied anyway, I sat down with the CEO John and the human resources director for a 3 hour interview. Yes, 3 hours! The time seemed to fly by, I just felt so comfortable with these new people I had never crossed paths with before. During the interview John asked me what I thought I could bring to the Niagara Hospice patients. I told him that I was more interested in what I could take away from them. Now, over 6 years later, everyone I meet I try to learn from. I've learned love, compassion, family, dynamics, fight, strength, fear, gratitude. I've learned a plethora of things from very many people, too many to count. Some people wake up and go to a place of employment that they hate, I can't say that. My husband often asks me to take days off with him, I hate taking days off. A day off for me means that at least 5 of my hospice patients will have to wait another week for their massage. Sometimes those massages are the only thing someone has to look forward to. I love what I do, I love the lives I get to touch physically and emotionally. We at Niagara hospice get to give back to people of all walks of life, we can be their stepping stone, their crutch, their support system. We all truly believe in the work that we do and we know that our families, patients and community believe in it too." "There are too many stories to share in my 18 years as a Niagara Hospice Medical Social Worker and Bereavement Counselor. Suffice it to say, every story is secure in my memory and has changed my life at a profound level. Through the patients and families of Niagara Hospice, I have learned the intense lessons, the important lessons. To live every day to the fullest, to love with my whole heart and never take for granted the truth and beauty that is all around me every day. I am a very proud Niagara Hospice worker and though none of my loved ones have been a patient yet, I have 100% faith in every aspect of this organization, especially my co-workers who amaze me daily with their strength, knowledge and wisdom." "My best friend, a person who was vivacious and lit up any room she entered...was struck suddenly in 2005. She was only 46. My life changed forever. That was the event that changed me and sent me on my present journey. You see, Sue wanted to become a nurse. So the next spring I became a CNA. I myself was 48. See it's never too late. I worked in ER and ICU. I liked it but something was missing. Then one day I saw an ad for a CNA at Niagara Hospice. I was thrilled! I didn't know that they hired CNA's. I was blown away by the "House," it looks like a luxury hotel. Well where else does your family need to be when dealing with such a stressful time in their lives? Where else can you get the quality of care that we offer? Free hugs, free food and a chance for family members to relax and just BE with their loved one and each other. People say wow how can you do that job? You guys are angels... We are not. We are just people who understand and care. You and your family member are going through so much. Let us help. We are here for you."